There's very little I remember from the 1941 version of Dumbo except for feeling incredibly traumatised as a child watching a cute little elephant be separated from his mother and the 2019 edition has the same desired effect but in a way that is slightly more hopeful. I am not traditionally a fan of Disney's live action remakes. Aside from 2015's Cinderella, I've found the films to be empty and lacking in adding anything new to the already well loved stories. What was great about Cinderella and now Dumbo is that although the morals of each original are clear cut, the remakes take on a unique spin that still honours its predecessor but introduces its own new themes that are contemporary for this generation. Dumbo held subtle nuances that nodded to the treatment of animals in captivity that are sometimes hard to capture in animation and also gave a fresh take on the inner battle of morality. Danny DeVito did a wonderful job as Max Medici, allowing his clear character arc written by Ehren Kruger to guide his development from cynical businessman to heartfelt father figure. Colin Farrell's character was slightly less developed but was enjoyable to watch nonetheless. His children, Milly and Joe, played by newcomers Nico Parker and Finley Hobbins did a brilliant job of finding the heart in a visual heavy film. Watching them find a piece of themselves in Dumbo's heartbreaking narrative was sweet and it helped the audience focus into his story amidst the villainous activity added by Michael Keaton. As always with Tim Burton's creations we are the audience of his imagination. No corner is left untouched in this 112 minute visual feast and it is hard not to be entertained with so much to look at. He somehow bottles the atmosphere of a fun fair, captures its magic and floods it onto the screen for us all to enjoy. 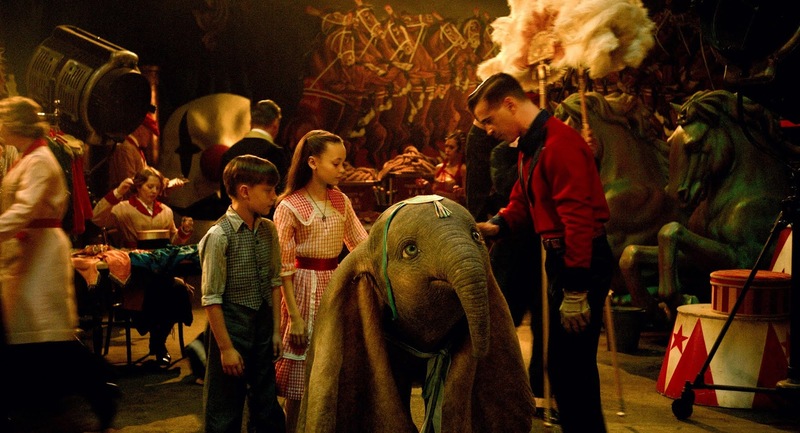 Just like real life circuses, there's something unnerving and eerie about the world of Dumbo. The overwhelming grandeur holds its dark secrets and Burton does a scintillating job of uncovering them. The film's strength most certainly lies in it being an experience which makes for a great Saturday afternoon activity for all the family to enjoy. Dumbo flies into UK cinemas March 29th 2019.